Hi impact reverberation is fundamental in achieving a great drum sound inside a mix. That deep, wide, aggressive sound is created by mixing both real rooms and hardware reverbs together. MoReVoX HiT! represents this combination of both real rooms and hardware (up to ten sources for each IR) mixed with the unique MoReVoX attitude. All the sources have been carefully placed in the stereo field, and the final IRs have been recorded on real tape and mastered in M/S for a superior warm spaciousness. 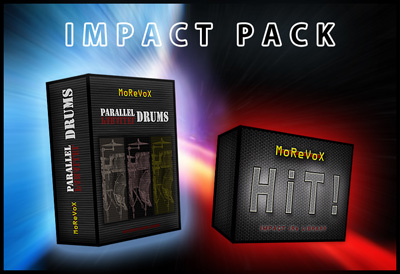 The classic MoReVoX reverb sound is here in full; it has been meticulously tailored for drums, percussion, and for every mix where high-impact reverb is required. - Large (Up to 3 Sec). HiT! is a time saver, you’ll be able to find the perfect reverb in just a few clicks and create your own Hi-Impact sound!